The Black Swan EP was sold out almost immediately, so we are now rush-releasing this new artist’s Debut Album. Tempted Dissident, or Te/DIS for short, here he continues what he started with Black Swan, and now it really gets going. The sound design has further matured and provides the ideal environment for the presentation of a voice, which, while intoning the cleverly constructed text, will always attract attention with its characteristic timbre. The voice is something special, and predestined for darkly melancholy compositions, which remain tenaciously in one’s memory. 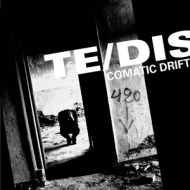 This is one of the strengths of Comatic Drift, the album awakens concerns over and above the mundane, and hooks into the aural canal with its driving angular sounds, while the vocals, in time with the pulsating analogue drums, spread doom and despondency. All in a completely unique fashion. It is easy to get into this new artist, who, with his coherent work, enriches Galakthorrö with a further interpretation of Angst Pop.